The following projects involve long-term construction and may create traffic disruptions and other impacts to communities. Not all PWD projects are represented. To report an incident or problem that needs immediate attention, please call 215-685-6300. 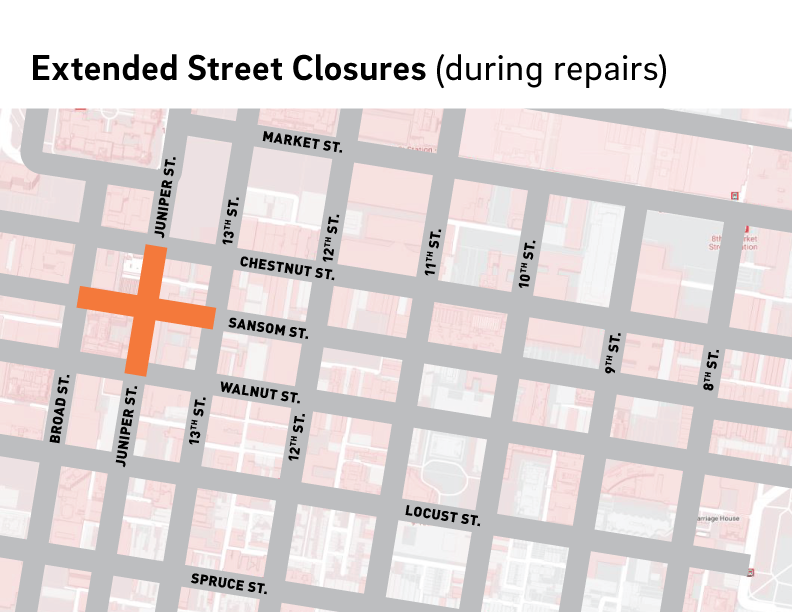 On Tuesday, July 3rd, at approximately 4:00 a.m., the Philadelphia Water Department was alerted to a water main break at Sansom and Juniper streets. The break occurred on a 48-inch transmission main, which supplies water to a large section of South Philadelphia and Center City. The water main was shut down at approximately 7:30 a.m. and crews began clean-up efforts in the area immediately. PWD also had Customer Field Service staff on site visiting impacted properties. All parties, their representatives, and experts interested in examining the break location should contact Brendan Reilly to schedule. The site is available for inspection on the following dates: August 17th, 18th and 20th. Philadelphia Water Department Commissioner Debra McCarty and additional staff met with business owners to provide updates and answer questions as work continues to repair the water main that broke at Sansom and S. Juniper streets. Read FAQ distributed at the meeting. If you were impacted by this main break and have not met with a PWD representative, please call (215) 685-6300 or email waterinfo@phila.gov. This is an an active site, with multiple utilities working to secure their infrastructure prior to turning this location over to PWD. We can then perform an assessment and determine the scope of work necessary to repair the water main and sewer. Once all infrastructure work is complete, the road will be repaved and opened to traffic. Another top priority is working to make sure that all businesses can open safely, and assisting in any way we can. View a map street closures. Philadelphia Water Department (PWD) will be embarking on a multi-year project at this site which will include the construction of new water tanks, general facility upgrades and additional site improvements.The East Park Reservoir is an important drinking water storage facility for the City of Philadelphia. The facility provides water storage for approximately 50 percent of the Philadelphia Water Department’s customers and provides reliable water service during emergency conditions. View a presentation that was delivered to area residents on January 29th and February 4th, 2014. It is important to us that contracts place a focus on increasing opportunities for minority, women, and disabled-owned businesses enterprises (M/W/DSBEs).See the links below for information related to M/W/DSBE participation on this project.